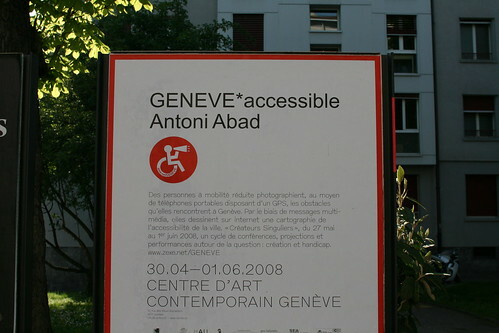 GENEVE*accessible by Antoni Abad is an intriguing project launched by the city of Geneva in partnership with the Handicap Architecture Urbanisme (HAU) association, with the purpose of making travelling easier for the disabled. The project is simple: disabled phone are handed out GPS-enabled mobile telephones so that they can take pictures of every obstacle they come across in Geneva. By means of multimedia messages they create a map of the accessibility of the city on the internet. The resulting work will be presented at the Centre d’Art Contemporain Genève, within a series of related live events: the “Créateurs Singuliers” week (27th May-1rst June). Why do I blog this? documenting interesting local projects around here. I like the bottom-up approach of the initative.